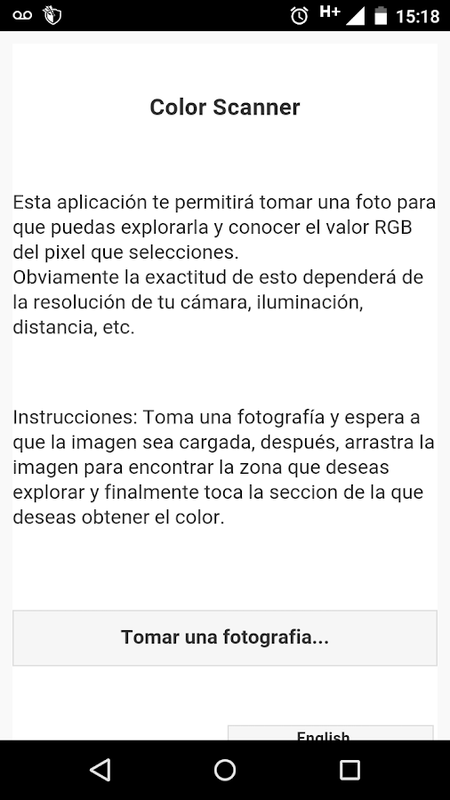 This app will allow you to take a picture and explore it in orderto get the RGB value of the pixels that you select. Obviously, thiswill rely on the device's camera quality, light conditions,distance etc. This is a very simple game, tap the ball and see how far you canget. Simple does not mean easy, but I will give you some clues:Touching the ball at the bottom works betterKeep the ball in theair, far from the field (but not too much) Have fun! Compatible únicamente con dispositivos TV Box (Dongle). No funcionasin activación por parte del personal de AKSI, ie. requieresuscripción.Compatible only with TV Box (Dongle) devices. It doesnot work without activation by the staff AKSI, ie. subscriptionrequired. New interactive experience for your AKSI TV.Connect and play withyour friends! Real Color Mixer simulates mixing real paints (for example oil oracrylic paints) in different proportions; making it possible topreview the newly created colors without actually mixing thephysical paints. The colors are not mixed additively (which is theprocess used in RGB color models). However mixing the colors red,green and blue in the Real Color Mixer does not achieve white orblack colors. Depending on which tones are used for mixing, youcan, for example, get a dark khaki color. Real Color Mixer uses thespectrum of light and a range of reflected and absorbed light of agiven color as mixing information. Features: - ability to define upto 10 colors for each palette - ability to save up to 30 mixedcolors for each palette - possibility to copy the palette -database of 430 predefine colors - ability to set the texture andform of the brush - create (from color picker, RGB or HTML colorcodes) and delete your own colors - edit color name - importing andexporting a palette To add a color to the 'mixer color' panel,press and drag the desired color. To change the mixing ratio, useplus (+) or minus (-) buttons. Pressing on the plus or minusbuttons increases or decreases the amount of specific color by oneunit. Pressing the button slightly longer will change the ratio ofthe color by 10 units. Minimalistic program to mix colors by RGB. From black to white,from blue to red, from green to brown and all other colors. Swipedown to get scroll bars down and swipe up to get scroll bars up. Create colors through different options such as CMYK, RGB, HSV,HSL, and HEX code. By adjusting the CMYK, RGB, HSV, and HSL scales,you can create colors through their respective methods. Simplyslide the scales and the color will appear automatically on yourscreen with the information. You can also click on the numericvalue next to the slider to input the value for the respectivemethod. The HEX mode allows you to input hexadecimal RGB codes forcreating colors. If the button turns green, then it is anacceptable code and it can be pressed to generate the color. If thebutton turns red, then the code will not be accepted and the textfield will be reset when pressed. The vectorscope allows you toadjust the color by tapping or sliding your finger to the desiredvalue which will then populate the CMYK, RGB, HSV, HSL, and HEXcodes. As you switch between the different color creating optionssuch as CMYK, RGB, HSV, HSL, and HEX, the color will persist andthe scales will adjust accordingly.A network connection is notrequired for this application and it will remain ad free.ABILITIES•Create colors through red, green, and blue (RGB) sliders• Createcolors through hue, saturation, and value (HSV) sliders• Createcolors through hue, saturation, and light (HSL) sliders• Createcolors through entering the numeric values for RGB, HSV, HSL, andCMYK• Create colors through CMYK sliders• Create colors through HEXinput (3 or 6-character amount accepted)• Create colors through thevectorscope• Ad freeFUTURE UPDATES• Fix layout issues with largerscreens• Update HSL and HSV slider colors• Double tap color to fillwhole screenSUPPORTIf you encounter any issues with text oranything appearing off screen, please let me know and I'll try andfix it. Also, feel free to send me any ideas, feedback, or thingsyou would like added. Hope you enjoy the app and find it useful! CSS color names application consists of 140 color names defined inthe HTML and CSS color specification.Selected color is displayedwith its name, HEX and RGB values, preview and shades table fromwhite to black.To copy the value to the clipboard, just click onthe appropriate value field.CSS color names app can be used withHTML, CSS and graphics editors, and as stand alone handbook aswell. v4.2New 3+ Remote Profile (Briloner,21 Key,CAR MATE) v4.0New 4+Remote Profile (BaseTech,HitLight,Lightme,SuperNight Lite) Removedunused storage access rightv3.6New 14/20/25 Keys Remote Profile3xmore independet widgetSelector Bug Fixed v3.3New 24 Key MusicRemote / Better IR Code for (isunroad & mcl remote profileFixindependet widget remote listv3.224P / 44P Keys Remote Profileadded Compatible with PaulmanIRC240S Profile Added BackGroundAlternative (Dark,Medium,Light)New 1x1 / 3x1 independet widget Youcan now change remote type via widget with Up & Down Arrow .FixDimm Up / Down &Settings-----------------------------------------------------------------------------v2.8NewRemote Profiles (24D / 24M / 24Z ) added LG G3 & LG G4 enabledfor BetaTest.-----------------------------------------------------------------------------v2.5NewGUI,Music Remote Profile added Renamed Widget Colors .Shiftkey BugFixed .Delay between commands greatly reduced. Some internal bugfixed .-----------------------------------------------------------------------------v2.244-Key Remote Profile now supports full keys. 40-Key RGBWRemote Profile Added.Puzzle Color Widget Added Puzzle Each ColorKeys works standalone.Now you can use your favorit colors withwidgetmix-----------------------------------------------------------------------------v2.1Redesigned widgets for compatible other launcher Small WidgetSize Now Compatible with Google NowLauncher-----------------------------------------------------------------------------Simple unoffical RGB LED Bulb IR remote control for phones andtablets with build-in IR blaster(Samsung Galaxy S4/S5 Note3/4 andtablets) .The purpose is not to replace the original remote,but itis handy in emergency situations (original remote is lost,etc).Thisapp uses built-in infrared port(IR-blaster) and Android 4.4.2 =>and up version (Yes 5.0 too)if your phone/tablet doesn't have it IRor non compatible version then software not works.Works withSamsung phones and tablets with built-in IR senderNo full screenads,no push notification ads or pop-up ads .No support on otherbrand phones and tablets like (LG,etc)Before buy you can test firstfree version with limited remote type.You can even send a requestfor non-supported rgb remote model support via email.Before requesta cancel try contact us via email with your wishDisclaimer/Trademarks:This app is NOT affiliated with or endorsedby MagicLighting,APA1616,OEM24-44Keys,IRC160N-1,MCL,Sylvania,ISUNROADor other RGB LED Maker Companyor Owner.Warranties:This software is provided by author "as is" andany express or implied warranties,including,but not limited to,theimplied warranties of marchantability and fitness for a particularpurpose are disclaimed.In no event shall author be liable for anydirect,indirect,incidental,special,exemplary or consequentialdamages(including,but not limited to,procurement of substitutegoods or services;loss of use,data,or profits,or businessinterruption) however caused and on any theory of liability,whetherin contract,strict liability,or tort(including negligence orotherwise) arising in any way out of the use of this software,evenif advised of the possibility of such damage.